Metering mode refers to the way in which a camera determines the exposure. Cameras generally allow the user to select between spot, center-weighted average, or multi-zone metering modes. Various metering modes are provided to allow the user to select the most appropriate one for use in a variety of lighting conditions. SPOT METERING: With spot metering, the camera will only measure a very small area of the scene (between 1-5% of the viewfinder area). This will typically be the very center of the scene, but some cameras allow the user to select a different off-center spot, or to recompose by moving the camera after metering. Spot metering is very accurate and is not influenced by other areas in the frame. It is commonly used to shoot very high contrast scenes. For example, if the subject’s back is being hit by the rising sun and the face is a lot darker than the bright halo around the subject’s back and hairline, spot metering allows the photographer to measure the light bouncing off the subject’s face and expose properly for that, instead of the much brighter light around the hairline. The area around the back and hairline will then become over-exposed. Spot metering is a method upon which the zone system depends. Another example of spot metering usage would be when photographing the moon. Due to the very dark nature of the scene, other metering methods tend to overexpose the moon. Spot metering will allow for more detail to be brought out in the moon while underexposing the rest of the scene. CENTER-WEIGHTED AVERAGE METERING: In this system, the meter concentrates between 60 to 80 percent of the sensitivity towards the central part of the viewfinder. The balance is then “feathered” out towards the edges. Some cameras will allow the user to adjust the weight/balance of the central portion to the peripheral one. One advantage of this method is that it is less influenced by small areas that vary greatly in brightness at the edges of the viewfinder; as many subjects are in the central part of the frame, consistent results can be obtained. AVERAGE METERING: In this metering mode the camera will use the light information coming from the entire scene and averages for the final exposure setting, giving no weighting to any particular portion of the metered area. PARTIAL METERING: This mode meters a larger area than spot metering (around 10-15% of the entire frame), and is generally used when very bright or very dark areas on the edges of the frame would otherwise influence the metering unduly. Like spot metering, some cameras can use variable points to take readings from, (in general autofocus points), or have a fixed point in the center of the viewfinder. 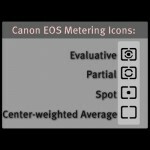 Partial metering is found mostly on Canon cameras. MULTI-ZONE METERING: Here the camera measures the light intensity in several points in the scene, and then combines the results to find the settings for the best exposure. How they are combined/calculated deviates from camera to camera. The actual number of zones used varies wildly, from several to over a thousand. However performance should not be concluded on the number of zones alone, or the layout. In general, the most advanced metering is found on DSLR cameras. With this lesson we conclude the technical part of this beginners tutorial. For anything else you want to know about please let me know. In the next lessons I will start talking about composition and other important aspects that you need to know to be able to take photos that will be appreciated. Stay tuned!